I’d like not to tell you about Joy Ladin. I know her professionally, but if I tell you her history, Coming to Life becomes her life story. The poems flatten, as you go hunting for clues. Attentive readers might find them anyway: “You were twenty-five again./I was still a man. Lit/by a lifetime’s bitterness” (“Something Else You Will Never Know About Me”). But what succeeds most about Coming to Life is when transgender themes (there, I said it—but Ladin never uses the word) sneak up allusively, or in which the specificities of Ladin’s life become relatable, generalizable, even while retaining their personality and subjectivity. 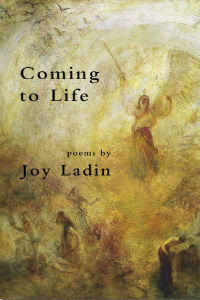 Coming to Life starts with a ritual Ladin wrote to “mark the passage from male to female,” each line ending in “joy,” but the book as a whole generally follows the timeline of Ladin’s transition. Many of the early poems paint pictures of domestic ennui – “Here is despair it spills from the houses / Surrounded by trees the color of illness” – but with particular twists and turns related to Ladin’s gender: “The stranger you have become / Is having an affair, / Torrid but loveless, / With the man / I never was” (“Affair”). This gives way to a sense of loss, which Ladin, a parent, renders elegiacally: “The lost father smiles down / From the snapshot summer / Where his children can always find him” (“Loving Him”). This is great stuff. 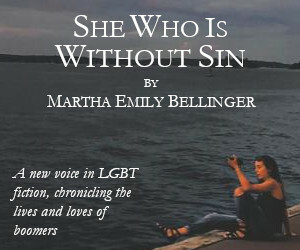 One might expect Coming to Life to be, as its title suggests, a celebration of new life. But the book, in its three-line stanzas and irregular meter, refuses the cheerlead and thus rises from advocacy to art. After a detour into a formal, oddly-placed section of poems about September 11 (to me, this section loses the thread and belongs in another collection), Ladin’s hesitating journey continues. “Today’s Forecast:/Intermittent life/Followed by Death. Tomorrow/Patches of death” (“Today’s Forecast:”). Gradually, Ladin proposes an “answer” in the fourth section of the book, not coincidentally the section richest in religious symbolism: crèches, Biblical quotations, talk of God and the tree of life. Now “the waters of death empty / Into the waters of life,” and the poet begins to acquire insight, even wisdom: “You were trying / To learn to walk When you needed to learn to swim…. You can’t make out the question / So you answer Yes” (“Answer”). Ironically, while the penultimate section of Coming to Life is rife with Biblical quotations, the final section is made up entirely of words taken from an issue of Cosmo Girl. Ladin’s transition is complete, but ironic: now she, too, is ready to be objectified and infantilized by popular culture. Yet, while there is some pop-cultural irony in this final section, Ladin manages to cut and paste the Cosmo words into a summation of her own atypical coming of age. “Now that you’ve graduated / From being abducted / For decades, you realize there are people / Exactly like you / Except they happened to be born” (“Fairy Tale Ending”). “You died, princess, and you live – That’s your fairy tale ending,” the same poem continues. The “fairy tale,” of course, has long been a genre where transgressive forms of gender and sexuality could be acted out. Often violent, and often coded with sexual references, fairy tales are far more gruesome and complicated than their bowdlerized, kid-lit versions suggest. 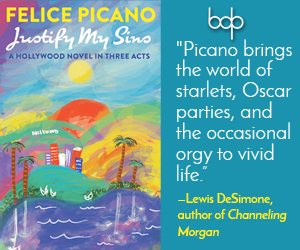 Likewise with Coming to Life, which might at first seem like a straightforward tale of affirmation and rebirth, but which comes to be far more interesting, and elliptical, in Ladin’s hands. I love that Ladin’s “fairy tale” adds yet another permutation to the genre. Now the dead-and-reborn princess, like the princesses cursed to live in the bodies of frogs, is someone who had to cast aside her old body in order to inhabit a new one. But this transformation comes at a cost, and its Neverland is the pages of Cosmo. Ladin’s diction is conversational, often spare. The directness with which she documents her transitions – not just gender, but also through grief to unease to “joy” – enables the ultimate artistic effect, which is one of artlessness. “Your unbelievable confidence / That you can escape the skin / That felt so ugly / And still become yourself / Changes the people around you” (“Thickening”). Those words transcend the specificity of gender transition, which is why to confine Coming to Life as a transgender book of poetry, or even a book of poetry by a transgender person, is perhaps to reduce it. So I’d like not to tell you about Joy Ladin.